I’ve been a fan of The Tick ever since stumbling upon his cartoon iteration back in the early 90s. Later, I watched Patrick Warburton’s 2001 live version and felt it really captured the right combination of Tick’s blank innocence and his earnest desire to do good, while placing it in a surreal version of The City. Now, another decade brings us another live version – is it third time’s the charm? Your answer to that question will vary depending on what aspect of the original show you loved most. If what you want is more of the uncanny valley weirdness of The Tick’s city, you may be disappointed. If, instead, you loved The Tick’s wonderful blend of naivety and invulnerability combined with a complete lack of self-awareness, then you’re in for a treat. While I have heard some moaning among my friends that the show isn’t bringing Warburton back (I may have been complaining a wee bit myself), it turns out that Serafinowicz is able to pull off the role commendably. I watched the series on my computer while wearing headphones, and my wife shot me annoyed glances on more than one occasion as I laughed out loud at The Tick’s antics (or is that ticktics? Tactics? TicTacs?). And one caveat to all the Warburton loyalists: he’s actually a producer on this series, so he’s at least still involved. But while the show is named after the big blue bug of justice, this series is really about Arthur [Griffin Newman] and his origin as the somewhat neurotic, haplessly reluctant hero The Moth. He’s so new to super-heroing, in fact, that he doesn’t even get a name by the end of the sixth episode. He’s simply known as…Arthur. Arthur’s very interested – one might say obsessed – with one of The City’s most notorious super-villains: The Terror [Jackie Earle Haley]. We find out why in a flashback sequence, when Arthur has a traumatic meeting with The Terror that changes his life forever. Cut back to the present, and Arthur’s the only person in The City who actually thinks that The Terror is still alive. See, he was killed by flying superhero Superian [Brendan Hines] several years before, and everyone knows this for certain, as they found The Terror’s teeth – but nothing else. Due to the traumatic childhood experience, Arthur has grown up being over-protected by his mother [Patricia Kalember] and sister, Dot [Valorie Curry], and being constantly queried about the health of his feet by his step-father, Walter [François Chau in a wonderfully understated role]. Arthur’s curiosity gets him into some trouble, and it’s while investigating an illegal arms shipment that he ends up meeting The Tick for the first time. 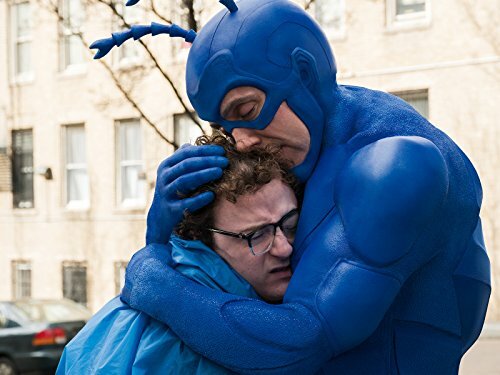 The show plays with the audience a little at first – is The Tick real, or a figment of Arthur’s over-stressed imagination? – but it gives us pretty clear indications as to the direction it will take when we see The Tick handily take out an entire gang of thugs, while throwing off one-liners about gun use and apologizing for his strength. Even if he were to try to fight the gang, there’s no way that Arthur could do it on his own – The Tick is not just a figment. 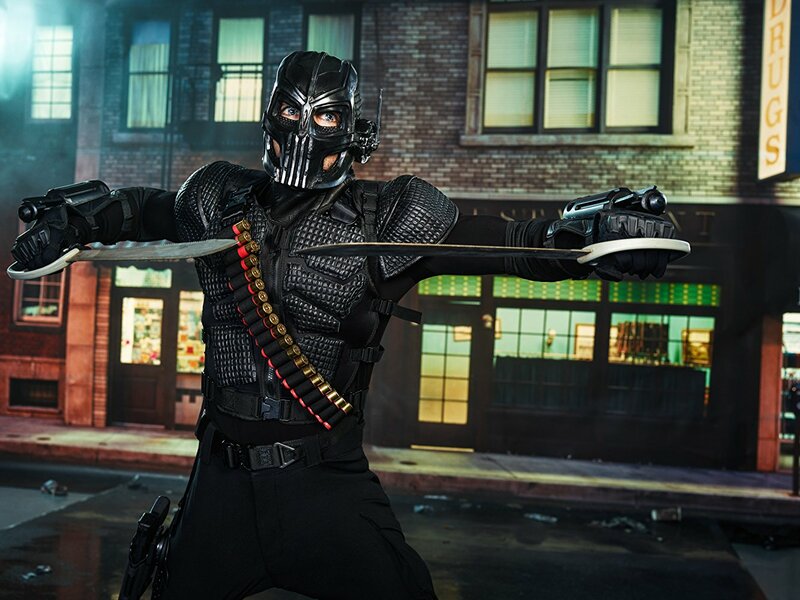 In addition to the cast mentioned above, there are two standout characters newly created for this series. The first is Ms. Lint [Yara Martinez], a former henchwoman to The Terror who is now working for two-bit gang leader Ramses IV [Michael Cerveris] and his Pyramid Gang (they all have lovely matching Eye of Horus tattoos, something Lint refuses to get). She has the ability to channel electrical energy, which has the unfortunate side-effect of attracting stray hairs and dust toward her constantly. There are some wonderful backlit shots of her with dust and lint swirling in to attach themselves to her hair, her clothes, even her eye in one scene (her left eye is glass – I’m sure we’ll get some backstory on how that happened at some point). Is the new Tick perfect? Not quite, but it’s a very good initial outing, with a load of promise, and I can’t wait for the second half of season one to drop. Six episodes was enough time to give us a taste of things to come, to get to know the main players, and to give us a sense of what is possible with this group. We end on a cliffhanger (seriously but not literally – you’ll need to watch the show to see what I mean), and there are a surprisingly large amount of little touches that flesh out the universe, hinting at more ideas dangling on the edges (what will happen with the VLM – the Very Large Man, a man exposed to radiation who keeps on growing, that we see only as a peripheral side-story? Why is the invulnerable Superian getting headaches? Why has he got Pumpkin Spice heat vision? Why is Walter obsessed with feet? And where did The Tick come from?). I have no idea if any of these questions will ever be answered, but I don’t really care – I’ll be there on the day Amazon releases the rest of Season One, headphones on, annoying my wife with my laughter. A promising first half-season with excellent character building and solid action. The combination of Serafinowicz’s Tick and Newman’s Arthur hits all the right notes, and Jackie Earle Haley’s The Terror is a new take on an old character that fans will be familiar with and will enjoy.